iOS remained the top platform for smartphone activations in the second quarter, despite its overall market share falling from 70% to 64%, according to Good Technology's twelfth quarterly Q2 Mobility Index Report. Android trailed behind with 32% market share during the quarter, up from 26% last quarter, while Windows rose to 3% market share to finish a distant third place. iOS saw its market share drop from 81% to 64% in the tablet market, a sharp decline from the iPad's previous 80% to 90% dominance in the enterprise, while Android grew from 15% to 25% during the second quarter. Windows rose from 4% to 11%, a notable increase given that Microsoft's operating system represented just 1% market share two quarters ago. iOS continued to lead in regulated industries, including the public sector (79%), education (76%), healthcare (70%), insurance (65%) and financial services (63%). Meanwhile, Android moved ahead of iOS in the high-tech sector with 53% of device activations and also experienced growth in the energy (48%) and manufacturing (42%) sectors. Good Technology's data is based on monthly activations among all its global customers that had at least five activated devices during the second quarter. The full-length Mobility Index Report Q2 2015 offers detailed insight on app, platform and device preferences among enterprise users. "It doesn't appeal to business customers because it doesn't have a keyboard, which makes it not a very good email machine." This is not really a surprise, however the conclusion is flawed. Most companies I know use the Good app for "Bring Your Own Device" to work. BYOD is a fancy way of saying you can use your personal device to access your corporate e-mails, schedules, etc. Companies like this as they don't have to buy mobiles for employees. Workers like it so they don't have to carry two phones around. The key here is the workers are buying more Android/Windows tablets. 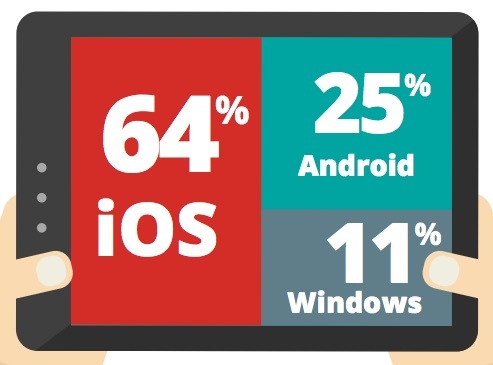 So, the good app is seeing a rise in BYOD authorisations. It's not necessarily a reasonable conclusion companies are buying less iPads. I will note from personal observation I'm seeing a lot more Surface tablets in the wild in business. I still don't see many Android tablets. iPads are by far the most popular. I make no claim my observations are a reflection of the overall market. Just sharin' what I see. In my company, we are restricted to one BYOD device for Good. Since each device requires the company to pay a fee, they will only agree to fund 1 licence per person. That means that I have good on my iphone but not my iPad. This seems important because if, as suspect, many companies have the same policy, then the statistics will be skewed. In other words, I would think Good's statistics represent how BYOD users prefer to see emails. I prefer my phone over the ipad since I do not take the ipad to most meetings. Given that many people have some combination of phones, tablets, and laptops, these numbers cannot reflect the total market. In my company I see iphones and androids about the same. I have never seen anyone with a tablet other than an ipad or ipad mini in the office. I think a larger iPad would go down very well in enterprise. There are many uses in the enterprise for an iPad once the display reaches laptop size. Especially given the fact it's so easy to pair with Apple Wireless Keyboard, Magic Mouse, or Magic Trackpad. I've found since I purchased these three peripherals a few years ago, they've been very handy with a variety Apple devices I own. P.S. : My nexus7 did not show up under enterprise activations, of course, but the point here is durability.